I like shelves. I like to use them and I like to build them. Nothing fancy, just useable inexpensive shelves. I recently made three different shelving units for our basement. Two of them are pretty much my standby design, and one of them is pretty advanced for me. The first pictures show my basic design. I usually use 1/2″ to 3/4″ OSB. It is inexpensive and plenty strong for my needs. I then use either 2 x 4’s or 2 x 2’s to build a frame. This becomes a shelf. Simply build as many as you need and then screw them to the vertical posts. Again, usually a 2 x 4. One of these shelves was recycled from a past shelf project. That’s why you might notice 2 x 2’s and 2 x 4’s mixed. It’s a pretty simple way of making shelving where looks aren’t critical. They don’t look bad, just unfinished. 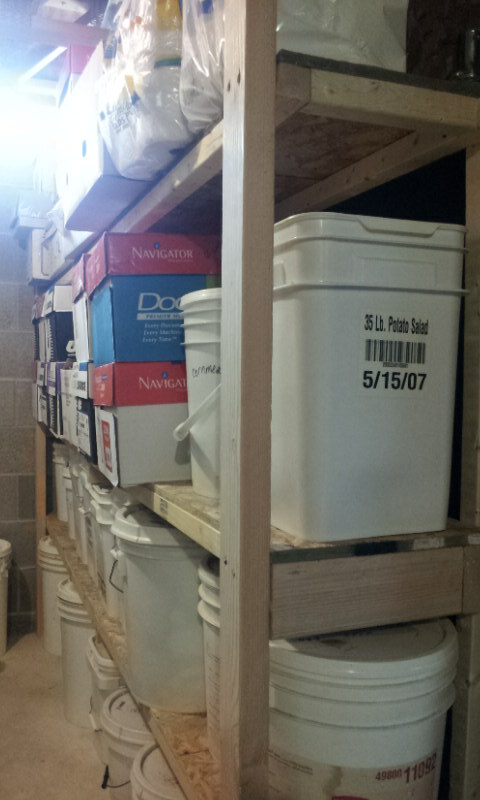 Usually when I make shelves I know ahead of time what I need to store on them. 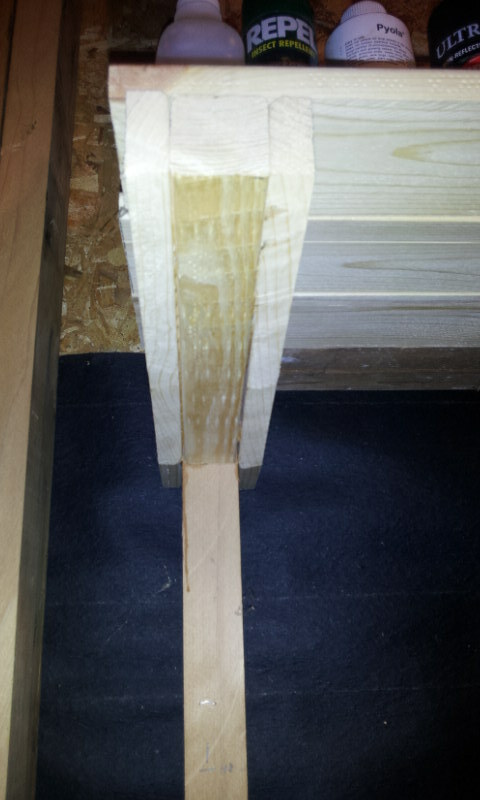 I simply measure the tallest item, allowing for the shelf thickness and put it together. This shelf is 8 feet long. I still need to add a vertical post in the center of the 8 foot length. You can see in the top picture that the center post is missing. One thing to keep in mind with this style of shelf is that you might have to have someone help you fit it together. 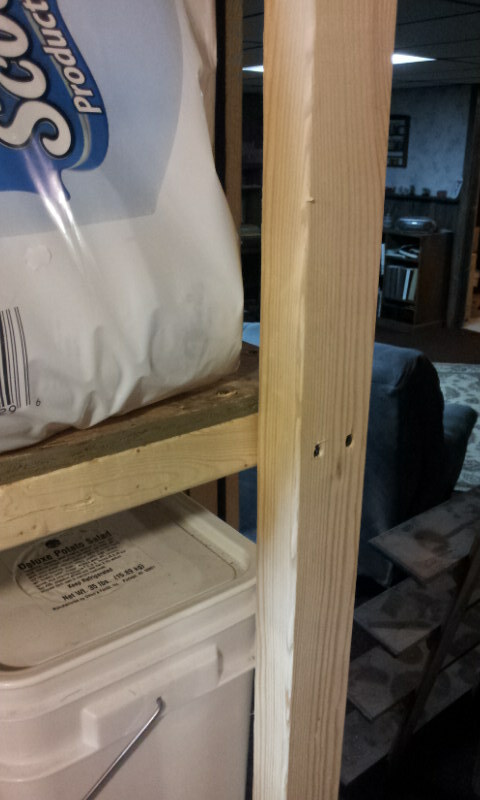 It can be tricky trying to attach the shelves to the vertical posts. One quick note. I recently noticed that Home Depot carries a 2 x 3 board. Just like a 2 x 4 but a little smaller. In my opinion this is a perfect size for these shelves. I believe the cost is about $1.55. Here is one more shelf unit like the one above except I notched out the shelf to accept the vertical posts. Basically the same shelf but the vertical posts are inline with the shelf and nothing sticks out. There is actually a narrow aisle here so I wanted to save as much space as I could. 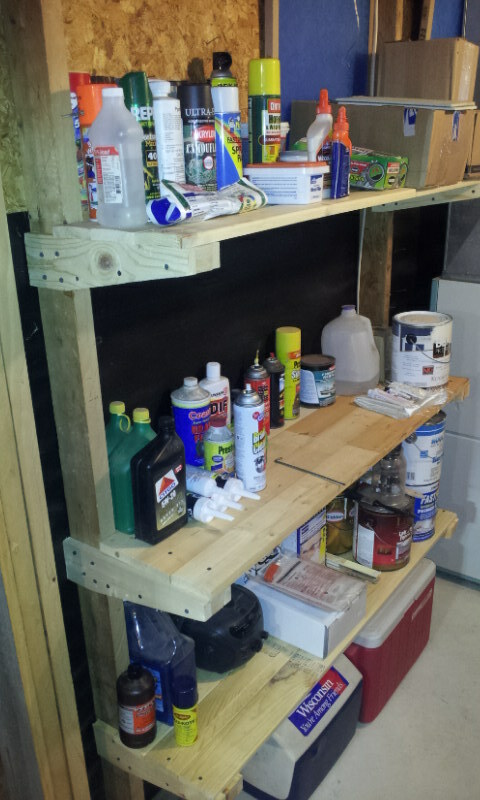 One other thing I did on this shelf is to fasten it to the cinder block wall behind it. I don’t think I would have to attach it, but I had some tap con screws left over from a different project so I did. 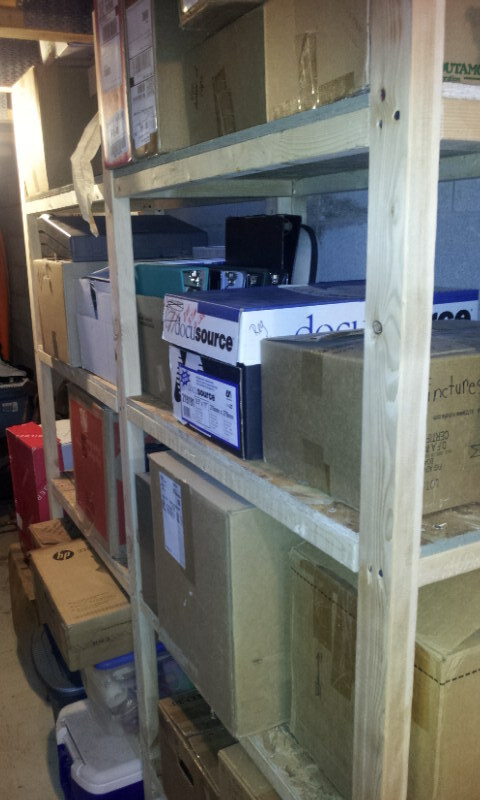 These shelves are very stable if you are not “leveling” challenged like I can be at times. They are also strong enough that kids may want to climb on them. That gets me to my newest design. I found this online while searching for some new shelf ideas. This shelf is very inexpensive and really easy to make. It uses 1 x 4 furring strips that you can get at Home Depot. I believe they cost about $1.50 each. The only other board is a small piece of 2 x 2. I think it looks pretty nice and they are very strong. 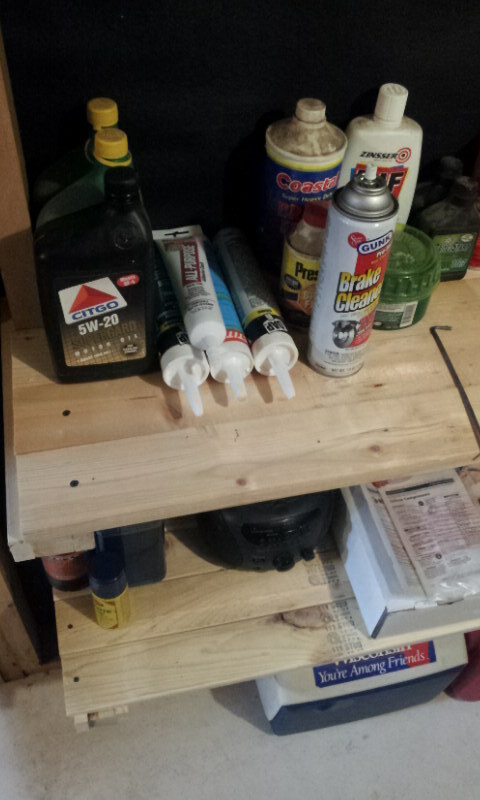 I use this shelf for keeping things that should be in the garage but I don’t want to freeze. Although this year you never know if it will freeze! This is a picture of the most critical part. From the bottom looking up. I’ll link to the source below this and let him tell you how to do it. Let me just say that it’s easy and not as critical as he makes it look. Let me know if you find any shelving ideas. I like these kinds of projects. Leave a comment! Here is a link to the original source for this shelf.